Original Talla clog is a classic. It’s handmade in southern Finland from local birch and designed to be the best fit for a foot. The sole has been developed by Talla founder in the 1980's. 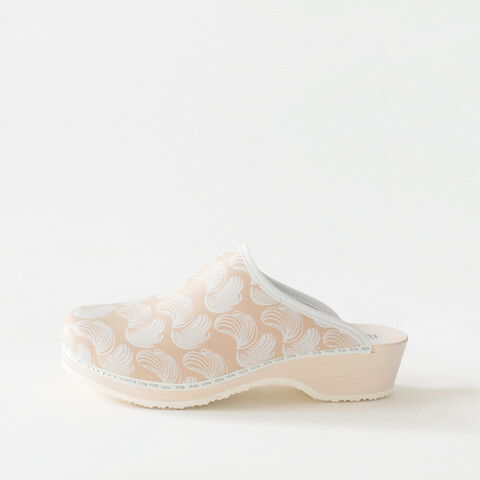 Talla uses the same footbed design still today to make unisex clogs and ladies’ sandals to customers around the world interested in comfort, timeless design and more sustainable lifestyle. Beneath the wooden sole is a thin rubber layer that keeps the shoe more weatherproof, softer, and, in this case feather-light to walk on. Sizes 35-42 available to ladies and gents, which means a bit wider sole for the latter. Pattern: Feather, beige with white band. Design by Piirre Collective, Finland. How to order: Finnish clog needs no extra room behind the heel, so the size can be as fit as a sock to ensure good shoe experience. Our shoes can be worn with or without a sock due to gentle finishing touches made by hand at our factory in Myrskylä, Finland. Simply measure your feet and follow our size assistant below. Please note: Due to a handmade product, each shoe is unique. However, there are no significant differences between a pair. The one-of-a-kind look and feel comes from the leather and wood used. We pack each order by hand to ensure the quality matches our high standards. How to take care: All shoes keep cool if they are taken care of properly. Our shoes are made from genuine leather and the wooden sole is unpainted/unstained. The surface can be swept clean with a damp cloth. A drop of mild detergent doesn't do any harm.